The Consumers Association of Bangladesh (CAB) reported on Saturday that the cost of living in Dhaka, in terms of retail goods and services, went up by 6 percent last year. 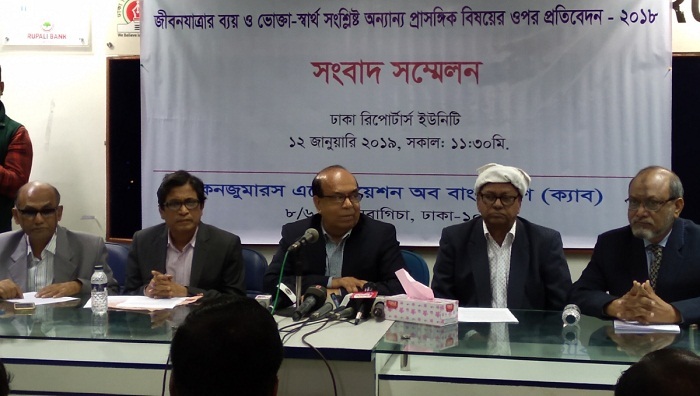 CAB revealed a report on the cost of living, not accounting for the cost of education, medical care or transport, at a press conference at the Dhaka Reporters Unity. Its chief Ghulam Rahman said the report included data on 114 food products from 15 retail markets and 22 regularly used goods. To prepare it, they took into account the cost of 14 services including gas, electricity and water. Prices of essential commodities and services rose by 5.19 percent, he said, reading out the report. The cost of living had increased 8.44 percent in 2017 and the price of commodities and services had gone up 7.17 percent, he said. According to the report, 2.44 percentage points decreased in the rate at which the cost of living increased. Ghulam said they calculated the cost of living by comparing the “basket” of goods and services purchased by consumers and comparing them to the total cost of the family’s basket according to weight. “The organisation did not have sufficient capacity to calculate their total cost of living because most Bangladeshis live in rural areas. But the report will paint a partial picture of the situation in the capital,” he said. Ghulam said cost of living won’t be problem if people’s income increased. According to the CAB report, soap prices increased the most in 2018 – 20 percent compared to 2017. Rice prices increased an average of 8.91 percent, fish 13.50 percent, vegetables 9.38 percent, betel leaves 7.18 percent and milk 13.33 percent. On the other hand, prices of pulse, salt, spices and sugar fell in 2018 compared to 2017. The cost of edible oil, powdered milk, electricity, gas, fuel and rail fare were unchanged. Prof Shamsul Alam, energy adviser to the organisation, said the county’s consumers paid Tk1.14 trillion in import duties in the last year, which is much higher than in neighbouring countries. However, 25.64 percent tariff was imposed on imports to Bangladesh in 2017. The average tariff rate in Southeast Asia in 2016 was 4.74 percent. The CAB report recommended, among others, to build work-oriented education, make price stabilisation fund, decrease default loan in banking sector, give priority to farmers; decrease electricity and gas prices.